If you’re missing teeth, we’ve got an affordable option that will have you smiling brightly in no time. 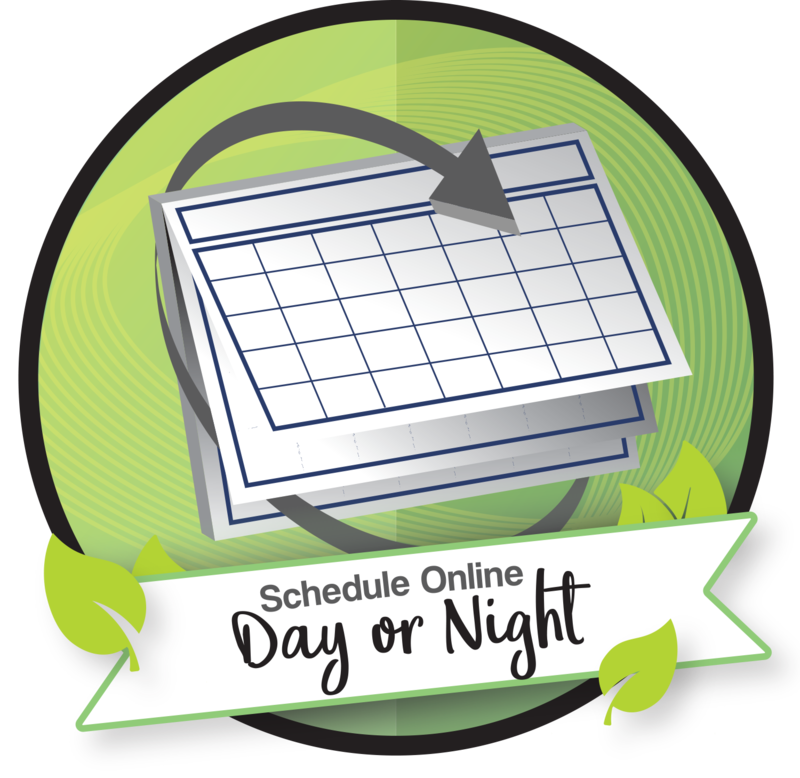 Before you do anything, you should schedule a consultation so your dentist can help you decide the best option. Typically, the preferred option for replacing missing teeth is a dental bridge. A dental bridge replaces missing teeth and looks like natural teeth. A bridge is a fixed dental prosthesis that bridges gaps in teeth by attaching to adjacent teeth. A dental bridge is a fixed, permanent appliance that consists of crowns to replace a missing tooth. The bridge is either supported by your natural teeth on either side of the missing tooth or by implants if you have multiple missing teeth in one area. The teeth or implants will have crowns placed on them and will support what is known as a pontic (fake) tooth in the middle. This pontic tooth is the replacement tooth for the one that is missing. While it may sound like you have a tooth floating in your mouth, the pontic rests close to the gumline and blends beautifully with your smile and surrounding teeth. 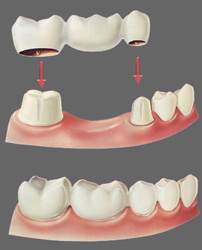 A three-unit bridge is recommended most by Dr. Michael Burbach and Dr. Kathryn Alderman over larger bridges. When a bridge spans over more than one missing tooth, it can put too much pressure on the supporting teeth or implants, causing damage. What is the procedure for a dental bridge supported by natural teeth? Like a crown, the procedure for a dental bridge supported by your natural teeth is usually a two-appointment process. At your first appointment, once you are numb and comfortable, an impression will be taken. This first mold will be used to make your temporary bridge. Dr. Alderman or Dr. Burbach will prepare the adjacent teeth for crowns. Tooth structure will be removed to make room for the crowns that will fit over the top of the supporting teeth. Another impression will be taken which will be used by the dental lab to fabricate your permanent dental bridge. The temporary bridge will be made in office so that you can leave with confidence while you await the professional dental lab to make your bridge. In about two weeks you will come back to our office, and the doctor will cement your permanent dental bridge into place. What is the procedure for an implant retained bridge? The procedure for an implant supported dental bridge will be different than one supported by your natural teeth. A dental implant looks like a small titanium screw. This titanium screw is secured into your bone by an oral surgeon to replace missing teeth. It takes the place of the root of your missing tooth. 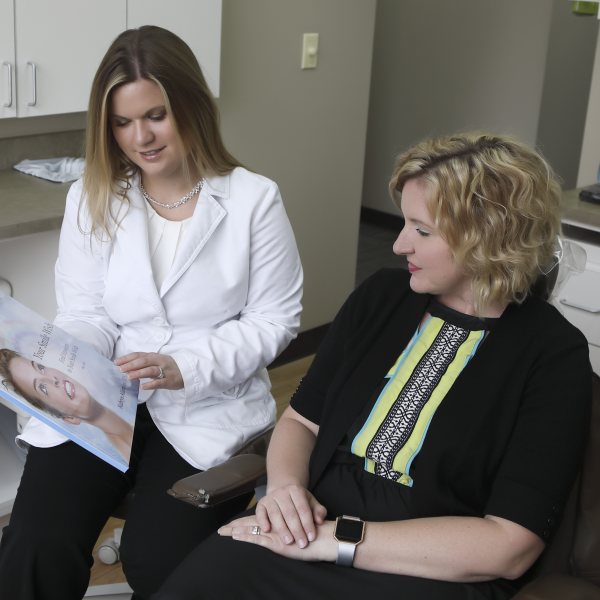 Once the bone has had a chance to heal around the implant (about three month’s time), a crown will be placed over the top by Dr. Burbach or Dr. Alderman. Dental implants can also be used to replace several missing teeth. If you have multiple missing teeth or teeth that need extraction, dental implants can be used in a couple of different ways to replace those teeth. The first option is to replace each tooth with an individual implant. This means a tooth implant will be placed in each space where a tooth is missing. The advantage to this option is that the bone will be retained in each space. Each implant will help prevent the bone from receding over time. 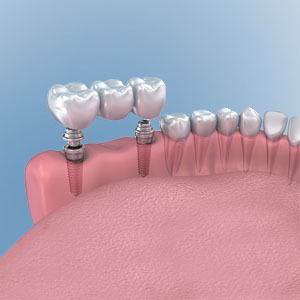 The second option is an implant supported bridge. A dental bridge consists of three crowns. Traditionally, a bridge can be used to replace a single missing tooth by preparing the teeth on each side of the space for crowns. The two supporting teeth will have crowns and support an extra tooth in between them to fill the missing space. If you have three missing teeth right next to each other, two implants can be placed which will be used to support the third tooth in the middle. hese implants will support a pontic tooth in the middle rather than be placing three separate implants.This option can be less expensive than the cost of three individual dental implants used to replace three neighboring teeth. While this is a good, cost-effective option, some bone loss can occur over time in the middle space as there is not a tooth or implant secured into the bone. While your implants integrate (heal) into the bone, you may choose to have a temporary removable flipper or partial denture so that you can smile with confidence and won’t have to be embarrassed by your gaps. Just as with a single implant placement, once the implants have healed and the lab has fabricated your dental bridge, you will come to our office to have the bridge permanently cemented into place. The cost of a dental bridge vs. implants is first dependent on whether you get a traditional bridge or an implant-retained bridge. 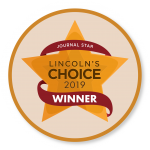 As an affordable dentist in Lincoln, NE, NorthStar Dental is committed to providing you with competitive prices along with affordable payment options and payment plans. 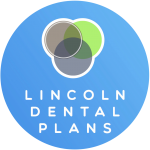 For a traditional three-unit bridge, the average cost in Lincoln, NE is usually about $900 per crown (3 crowns) plus tooth extraction cost if the tooth is not yet removed. The extraction cost can vary, beginning around $150 depending on whether the procedure can take place in our office or if an oral surgeon will have to do it. Where the procedure takes place is dependent upon the condition and location of the tooth that needs extraction. If you have dental insurance, your insurance may pick up a portion of the cost depending on your policy. It is important to know if you have a missing tooth clause in your insurance policy. This clause states that if the tooth was missing before the policy was in effect for you, they would not pay to replace the tooth. A dental implant is always a better choice for replacing missing teeth. Because a dental bridge requires two supporting teeth to hold it in place, if the tooth next to the missing tooth (or teeth) is a healthy natural tooth, it would be better to use implants. This is a more conservative solution because the unnecessary cutting of healthy teeth to place the bridge is avoided. An added benefit of using implants over bridges is that an implant preserves the bone structure of your jaw just like a natural tooth does. This means less receding bone and greater facial support. Implants can be used support a dental bridge. An implant-supported bridge is another option to replace missing teeth. Bridges unlike dentures are permanently fixed in place and act a lot like your natural teeth. And, unlike dentures, bridges are usually made of porcelain and not acrylic. A bridge supported by implants is an alternative if you have missing teeth or are going to need to have teeth extracted. Costs for several implants to replace every failed tooth can be greatly reduced with implant-supported bridges. If you have three to four missing teeth, for example, a bridge can be created by placing two implants and using them to anchor that bridge. 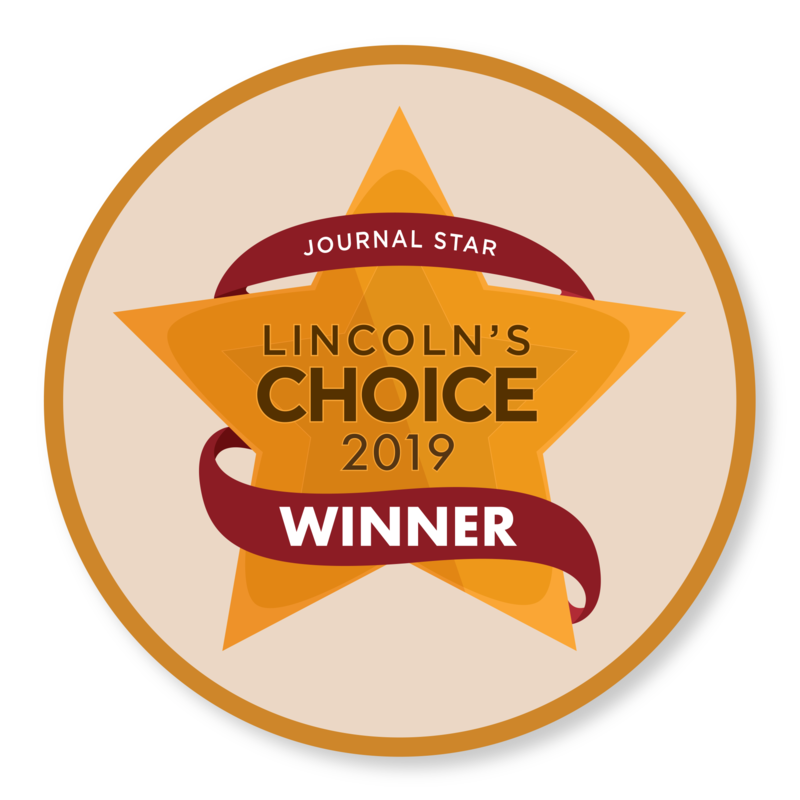 For an implant retained bridge the average costs in Lincoln, NE are usually about $1,800 per implant (2 implants), plus about $900 per crown (3 crowns). If the tooth has not already been removed, then the oral surgeon will take care of that as well. Some insurance policies will cover part of the cost of dental implants and restorations (crowns) while others do not. It will be important to check with your insurance so you know exactly what to expect. We are always happy to call on your specific policy, though information shared with our office may be limited.